I'm a pretty poor Malaysian. Having been brought up in Europe, I've never really been in touch with my heritage. And when it comes to food, I think I am probably even worse. I don't like fish, I don't like laksa and I don't really like rendang either, amongst many other things. However, there are quite a few things I do like. These include fruits (such as durian, rambutan, mangoes, lychees...geez, I'm drooling at the thought of these), roti canai, chicken rice, char kway teow and mee goreng. Most of these are readily available at most mamak stalls and are so dirt cheap that the prices would make you cry. Anyway, walking through Chinatown this weekend, looking for somewhere to eat, I decided to visit a Malaysian restaurant I've had my eye on for a while. On entry, I was pretty embarrassed not to understand a single word any of the waitresses said and when they realised I could only speak English, had a little chuckle to themselves and showed me to a table in a rapidly filling room. I ordered a Teh Tarik whilst I perused the menu. 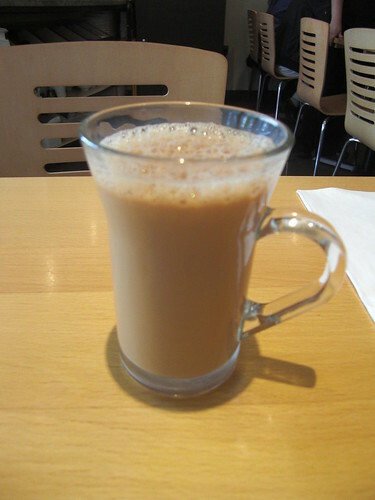 Teh Tarik literally means "stretched tea". This comes from the appearance of stretching as the condensed milk sweetened tea is passed between two cups in order to cool down the boiling hot tea. There was no such exuberance on show here but it was very nice. 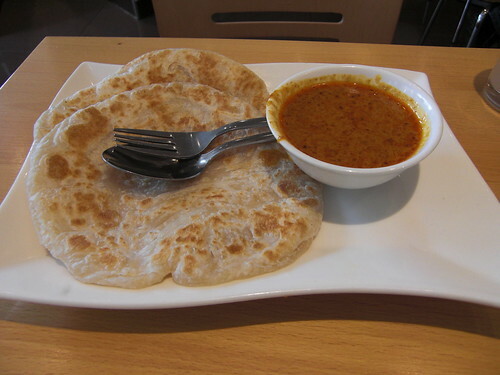 To start with, I ordered some roti canai, a Malaysian flatbread, served with a small bowl of curry. Whenever I go back to KL, Section 17 is one of the first places my family over there take me and we gorge ourselves on roti straight from the oven. This was never going to compete with that. The roti could have been crispier and the accompanying curry had a very strange sweetness to it. It was ok, but that is all. I was quite looking forward to the Hainanese chicken. Its a pretty basic dish of boiled chicken, to break it down in the basest of terms. The stock formed from boiling the chicken is normally included in a soup and used in the rice so the flavours of chicken run through the entire dish. I'm sorry to say, although it certainly looked the part, I found the whole dish quite bland. I enjoyed the rice, with flecks of ginger running through it, but the chicken itself didn't really have that much flavour and was quite fatty. Even doused in soy sauce, it didn't really take on any of that lovely soy flavour. All in all, the experience was meh. For those unaware of that means, it basically means it was just ok and nothing more. It's not expensive, by any means (my food came to £10) but when you consider how much you would pay for this food on the streets of KL, I really yearn for a return to Malaysia. It has been over 5 years since I was last back and not a lot beats the hawker stalls for value and taste. I'm so glad that I will probably be heading down in the new year, although I'm not sure my waistline will agree. 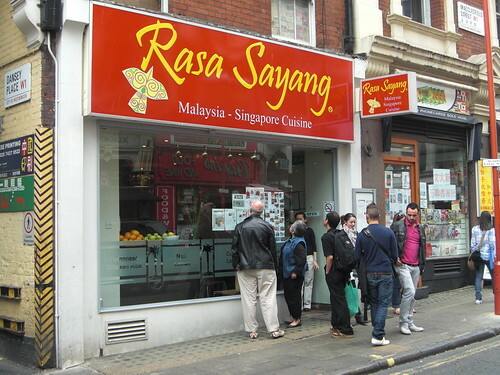 Just dropping by - it really is a shame that there isn't much good Malaysian food in London. There was one obscure one run by students in Paddington but that place got closed down, so right now we are not left with much choice. Kiasu (bayswater) being the best of the lot but by no means amazing, whilst on the other end of the spectrum there are plenty of really crappy ones (e.g. Georgetown). I truly didn't realise that there are so many of us! Incidentally, walked past Kiasu yesterday. The name always makes me laugh but not eaten there yet. Nope, Kiasu is still open (in Queensway, right?). I walked past it on Sunday and it was packed! I just found your blog through the Urbanspoon leaderboard, and I'm enjoying your posts. Re: the "meh" food at Rasa Sayang, I kind of agree. I ordered a large number of dishes with friends, and while quite a few of them were good, too many were bland or tough to make me want to go back. (Leong's next door still does it for me). I'd be curious to hear your thoughts on Sedap in Clerkenwell/Old Street. Im a very bad Malaysian who has never liked Malaysian food. I am making it my mission to find a malaysian restaurant I like and then take the litmus paper that is my dad! Am hesitant to order Prata/Canai because they invariably ended up as those frozen variety. But from your pic, it seems that fine. Will probably give it a shot the next time round. I frequent Sedap as it's a stone's throw from my place. The service is great and Julie (da boss) is friendly too. But if you were to drop by, do try the Nonya kueh, they're are way better than those that I've tasted in Singapore, not sure about Malaysia though. 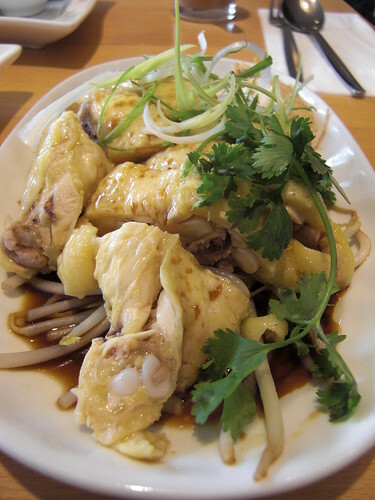 Hainanese Chicken Rice is one of my all-time favourite dishes. Have eaten it in a plethora of places in KL, and personally, I rate the one at Rasa Sayang very highly. It's the first place I'll go to eat whenever I am in London (which is quite often) and, hell, it'll usually be the last place I go to before I leave as well, hehe). 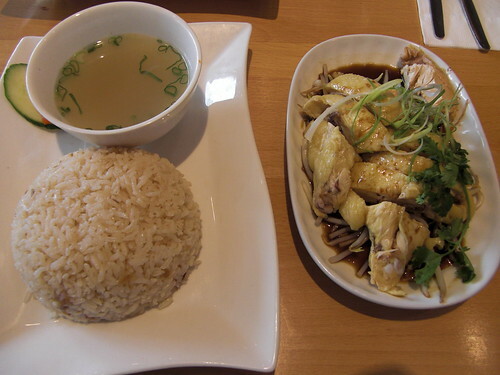 I've only ever tried a few other things on the menu, which were ok (a clear noodle and chicken soup, the name of which eludes me, was also particularly delicious), but for me, the chicken rice is so good, I never bother to order anything else! I used to be a diehard Rasa Sayang fan until I found Roti King (which is just around the corner). You sit at the bar and he makes the rotis in front of you! I think they're a lot better than the ones at Rasa Sayang, less oily and he does some great curries with them - lentil, fish (my favourite - although I'm guessing from your post not yours!) and meat.